Since 2009, MacStories has delivered quality articles for the Apple community with a focus on depth, accuracy, and personal stories. We've written thousands of detailed app reviews. We've covered news with facts and opinions. We've shared stories on how technology is changing our lives. Now, we're ready for the next step. Today, I'm thrilled to introduce Club MacStories. Club MacStories offers exclusive access to extra MacStories content, delivered every week. At $5/month or $50/year, our most loyal readers will be able to enjoy some great perks. You can subscribe to Club MacStories here ($5/month) or here ($50/year) today. You'll receive the first issue of the all-new MacStories Weekly this Friday, September 18th, directly to the email address you used to sign up. After purchasing a subscription, you'll be able to manage all your settings and view your Club profile at macstories.memberful.com. You'll get a receipt via email from Memberful, and the email you used will be automatically added to our MailChimp list to receive newsletters every week. That's it. I feel like Club MacStories is the realization of everything we've been doing for the past six years, and an important next step for MacStories and our relationship with MacStories readers. Allow me to share a few thoughts on why we're doing this and how we've tested Club MacStories for a full year before launching it, as well as more details on what it'll actually be. We've grown a lot in six years, and we want to keep making MacStories the best independent blog in the Apple community. This is why Club MacStories is not a paywall for the site. We've worked hard to make sure our articles can be read comfortably on a website that respects the reader and by as many people as possible around the world. This was our goal with the launch of MacStories 4.0 last year: we strived to build a new foundation that would help our writing and make our readers happy to read MacStories in any browser. The results couldn't have been any better. We're not putting MacStories articles behind a subscription – not today, and not in the future. That would defeat the entire purpose of MacStories: helping people find great Apple coverage that is unique to this website. We're simply not interested in changing how MacStories operates. Our website will remain free and open to everyone because it's the right thing to do. Club MacStories is, primarily, a way to unlock additional MacStories content that serves as companion material to the website. It's delivered by email because we believe in the feeling of joy and surprise when receiving a new issue of MacStories Weekly each week (but we're also considering additional delivery formats for the future). On top of the extra content that you pay for, you'll also get a chance to be an awesome reader who makes a direct contribution to the MacStories team. Effectively, Club MacStories will enable us to expand and produce even more articles for the site. It's a virtuous cycle: I want to keep writing MacStories forever – if that wasn't clear enough – and I want to keep reaching new readers every day together with my team. Hopefully, with time those readers will find MacStories valuable and they'll choose to become Club members, getting more great content in return and facilitating further expansions. I've personally thought about this for a long time. Readers have been asking me to enable donations on MacStories for years, but that never felt right to me. While I'm humbled by such requests, I've always wanted to offer something in return. Today, I know what we can offer. Behind the scenes, we've been testing the main features of Club MacStories for a year – and we think you're really going to like them. The main perk of Club MacStories is MacStories Weekly, an email newsletter delivered every Friday featuring great app recommendations and tips, Q&A with the MacStories team, a collection of interesting links and Home screens, and more. We launched the first version of MacStories Weekly last year (on August 22, 2014) as a free newsletter, and, for over 12 months, we've been improving the sections we curate every week and we've been listening to feedback from our readers. We know we can deliver MacStories Weekly with consistent quality and timeliness. We have delivered 50 issues of the original MacStories Weekly in 55 weeks, taking only 5 weeks off for holidays and personal reasons. You can browse an archive of old MacStories Weekly issues here. A preview of the all-new MacStories Weekly, launching this week. With Club MacStories, we're ready to take our beloved MacStories Weekly to the next level with a brand new design, new regular sections, and more topics each week (also, no ads). We think of it as MacStories Weekly 2.0, which wouldn't be possible without a direct contribution by our readers, and which contains a lot of the ideas we've been considering for the past year. MacStories Favorite: A great app that deserves to be on everyone's iOS device or Mac. We try a lot of apps every week, and you can expect the best stuff to always be showcased here – both big name apps as well as hidden gems. MacStories Collections: There are over 1.5 millions apps on the App Store, and we've always tried to showcase great apps in selected categories. We don't believe in highlighting a single "best" app that can fit everyone's needs. With the MacStories Collections, we'll highlight our favorite apps for a category or to perform a specific task that we've tested and that we can recommend, so you can judge what's appropriate for you. We'll also go beyond apps and collect workflows, features of apps, Mac software, and more. Tip: Everyone loves to be more productive and save time on their devices. In this section, we'll share a tip to get the most out of your apps and become familiar with details you didn't know existed. Home Screens: Another great way to discover new apps and workflows is to peek at someone else's device. In this section, we'll interview friends of MacStories and ask them to share their Home screens, explaining the reasoning behind their setups. In the new MacStories Weekly, we'll expand beyond iOS Home screens to include Watch Home screens, watch faces, OS X docks, and menu bars. Interesting Links: We discover interesting stuff on the web every week, but not everything can be covered in detail on MacStories. And yet, we feel there's value in sharing the interesting links we come across every day – whether they're great reads, other tips and tricks, fascinating stats, or videos. Media Pick: MacStories Weekly comes out each Friday – just in time for the weekend. In this section, we'll recommend our favorite non-app content (games, music, books, movies, podcasts, etc.) that can help you unwind over the weekend and prepare for the week ahead. On top of these returning sections, the new MacStories Weekly will feature more sections meant to address reader questions and surface even more great links and apps from around the web and the App Store – always carefully handpicked by the MacStories team. Weekly Q&A: This is something we've wanted to do since last year. Each week, Club MacStories members will be able to ask us questions directly. Questions can be about anything – apps, Apple news, productivity questions, Italian cuisine – you name it. We'll pick a handful of questions each week and we'll respond in MacStories Weekly. Club MacStories members will receive instructions to submit their questions via email after subscribing. Silvia's Design Desk: We love to point our readers to interesting design articles and tutorials, and we're lucky enough to have designer Silvia Gatta on our team. She'll be curating a new design section for MacStories Weekly, picking the best design links from around the web. App Debuts & Updates: We can't cover every app that comes out on the App Store, but we've been looking for a way to point our readers to noteworthy app releases and updates. In the new Weekly, we'll highlight the week's most notable app debuts and updates. MacStories Weekly has been one of the most rewarding MacStories-related experiences of the past year. It's been a labor of love every week, and I'm excited to take it one step further with more content and new sections – but also with the same focus on team curation and personal recommendations. As we work on MacStories every week, we come across news that take us a while to fully consider and we try apps that may not end up being reviewed on the site. Additionally, being an indie production, I think there are some fascinating aspects of how MacStories is made that could help people in similar efforts. This is what we're going to explore in the Monthly Log: reflections on the past month in Apple news, and a collection of musings and notes on how we work and manage the site. Think of it as a monthly journal on everything MacStories – a behind the scenes mixed with a personal productivity journal. The Monthly Log will be delivered towards the end of each month (no fixed weekday) and it'll be medium-to-long form, with all original content exclusive for Club MacStories members. I've long been fascinated by the idea of a "Making Of" for MacStories, and I'm excited to publish it with an episodic format for our most loyal fans. After six years of MacStories, we've gotten to know quite a few developers who are behind the apps and services we use every day. Occasionally, with their help, we'll offer discounts and giveaways exclusively to Club MacStories members. In addition, we'll offer free downloads for Club Members. We're going to start with an eBook, and it's our plan to produce EPUBs for our longer articles on a regular basis. What Happens to the Old MacStories Weekly? The original MacStories Weekly is ending this week. We'll be sending out Issue 50 today. 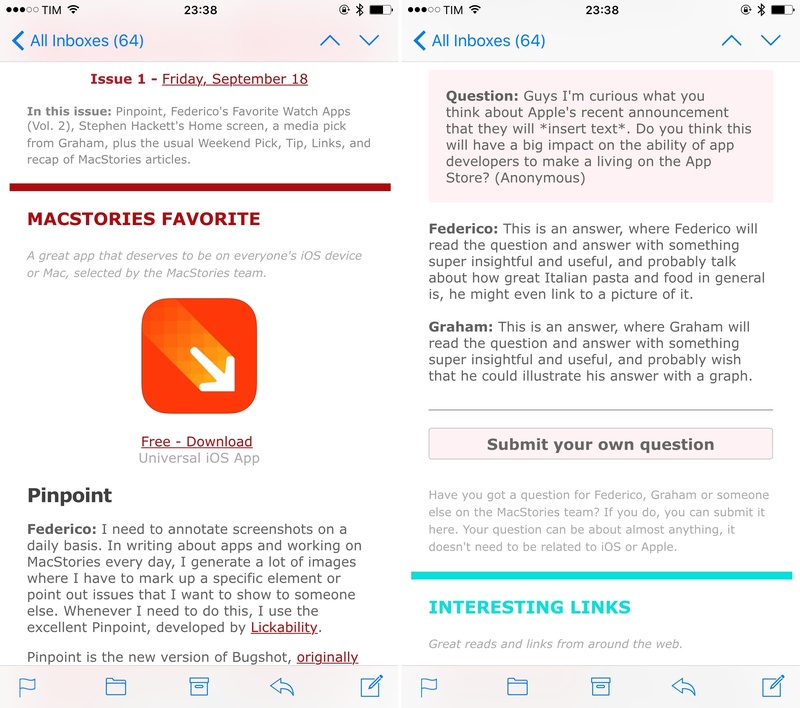 The new MacStories Weekly will be a new subscription, completely separate from the old newsletter. A fresh start was the only way to ensure a clean transition to Club MacStories. We've always said that the first MacStories Weekly was an experiment and it was going to end eventually. We're extremely thankful to our readers who have supported us for 50 Issues, and I genuinely hope you enjoyed our work for the past year. You can subscribe to Club MacStories with a $5/month or $50/year subscription by tapping the buttons above (if you're on an iPad or Mac, you can also go here or here with separate tabs instead of using the overlay). If you choose the annual option, you'll effectively get two months for free (and a warm virtual hug from us). Subscriptions are handled with a Memberful integration on MacStories. Memberful uses Stripe to securely process payments. Credit card data is sent securely to Stripe before the payment form is submitted. Memberful never sees your credit card data – only Stripe does. Stripe is PCI compliant and secure. MacStories, Memberful, and Stripe all use HTTPS, and we promise to never spam or resell the email address you'll use for Club MacStories; you can read the Memberful and Stripe privacy policies here and here. We'll only use your email address to deliver MacStories Weekly, Monthly Log, and Club MacStories-related communications; access to giveaways and discounts will be handled through MacStories Weekly and the Monthly Log. You can manage and cancel your Club MacStories subscription at any time by going to macstories.memberful.com and logging in with your Club MacStories account. For more questions, you can check out our Club FAQ page. Every day, I feel incredibly lucky to be able to call MacStories "my job". I've been writing MacStories for six years, and there have been a few bumps along the way. But in the process, I've learned a lot and I've had the privilege to assemble a terrific team of regular writers and contributors who are more friends than colleagues – exactly as this site's tagline says. The MacStories you know and love will continue as long as I have the strength to write. I want this website to be my legacy, as it's all I've ever learned to do sufficiently well in my adult life so far. I love MacStories too much to imagine not having it. Most importantly, MacStories will continue to be a free and open website because we want as many people as possible to read our stories. But, at the same time, I'm also ready for more – something a bit more focused and dedicated to our biggest fans, built with care every week and delivered with the same passion that we put into MacStories every day. Club MacStories is a new challenge for us, but I know that I, Graham, and the rest of the MacStories team can pull it off consistently and with the quality you expect from MacStories. If you love MacStories as much as we love making it, I hope you'll consider becoming a Club MacStories member. This isn't just about good feelings and supporting MacStories directly (although that's pretty great): you'll receive what I believe are useful and informative newsletters every week, plus a recap of everything MacStories and more every month. MacStories has always been about depth, accuracy, and personal stories. It's our goal to extend these values to Club MacStories and keep doing so in the future.